What a fun evening! Lots of laughing and catching up and the quilts were awesome. Once everyone was there and settled in, we drew numbers to see what order the quilts would be revealed. I was lucky because Linnea drew #1. I headed out of the room while Linnea hung my quilt on the wall. Look at what I came in and saw on the wall! The colors are perfect for my living room and each of those circles is machine sewn into their respective cut-out. I need to find out more about how she did that! Next up was Nadine. She made this quilt for Linnea, her sister. She is a bit of an over-achiever and had this quilt done in February! Nadine was a little stressed for the past couple of months while Linnea was working on my quilt. Linnea evidently (I wasn't allowed to know) was going on and on about not liking appliqued circles and Nadine was sure Linnea wouldn't like her quilt so she was considering making another quilt for her! In the end she didn't and here you can see Linnea examining these circles. She loved her quilt! Next up was Sally who made a quilt for her best friend, Nadine. She bought a kit a few years back thinking that it would be perfect for Nadine so this was the perfect opportunity to use it. I think she liked it, don't you? I had drawn #4 so Sally headed out of the room for a few minutes while this went up on the wall. She had requested neutrals with maybe a little color. I bought a huge pile of neutrals and found this pattern in Scrap Basket Surprises by Kim Brackett. It is called Snail Takes a Detour and is an adaption of the traditional Snail's Trail block. I had the center done and started looking for a border fabric that worked and suited Sally. I was fabric shopping with my niece, Katie, in June and found this mushroom fabric. It was just perfect - the right colors and Sally and her husband, Jay, are avid mushroom hunters. Next up was Mary. She made this quilt for Cindy. Cindy asked for brights and this is definitely bright! Mary didn't get the quilt finished for last night but the top is done and she has a great backing fabric so it should be done soon. I think she deserves a break though since she designed this one herself and it has 529 3.5" squares separated by black strips. Each piece was sewn individually! Cindy was so happy with this one! 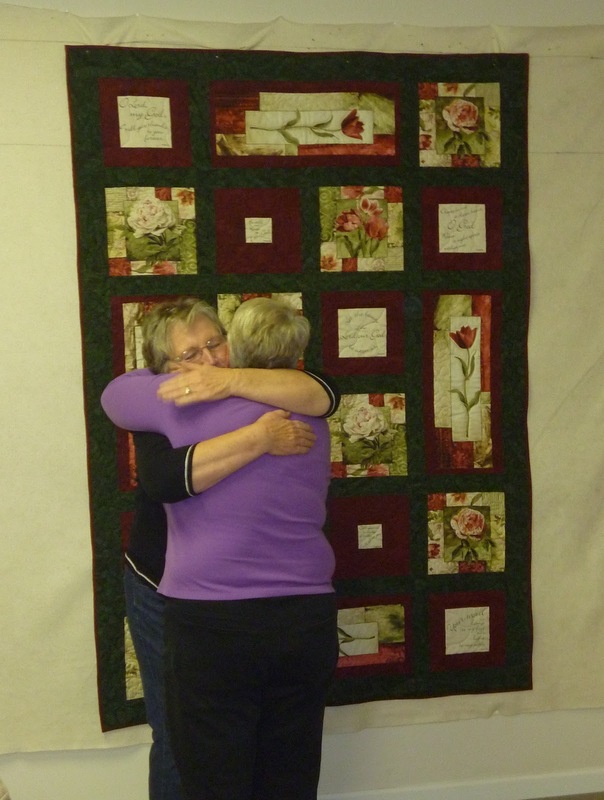 Finally, it was Cindy's turn to hang her quilt for Mary. Mary asked for red and white and this is just stunning! Cindy did such a great job on this! The points are all perfect! I also love how she added smaller blocks for the border corners. After delicious treats, we drew names for this next year. We will be celebrating our reveal on November 12 next year and I will be making a quilt for Nadine this time. Not sure what it will be but she did say she likes red or purple and has always wanted a quilt with blue bear paws. It has given me some ideas but that one will have to wait till after the new year! Today my goal is to get two coats of paint on the bathroom walls. Yesterday I did the spray on texture and primer so I am good to go first thing today! Those are some awesome quilts!